The way I was taught is that we are not the medicine, but we are the hallo bone in which the medicine can flow through us. Throughout the centuries, we have been called many things by many people; curandera, wise women, priestess, keepers of the secrete ways, shaman. Another way sickness comes to us is by an invasion to our body and energy field by an unwanted source. My job is to help release the energy and put balance back into the body so the energy cannot attach itself back. We also carry energy blocks in our DNA. That could be past sickness from our assisters, or stresses from our family life styles. An example of this is that the family worked in the coal mines for many generations, and the person I’m working on has a hard time breathing but the doctors can’t find anything wrong. I might find that there is stuck energy in the DNA from the generations who worked in the coal mine and died because of breathing the air from the coal mine. These are only a few examples of the imbalance I have work with. My people come from the Americas and Spain. The Americas was only one land until the Spanish came to divide us. I still consider the Americas as one land with many man-made lines that keep us all apart from being in our Truth. This land – our world – our universe, we are all one. The old ways teach this. I walk the old way to be one with the universe and to be one with god. 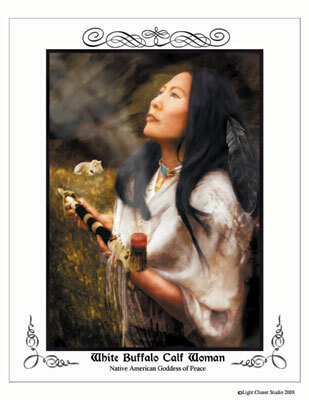 I was taught to serve the medicine in many ways through prayer, herbs, song, dance, stories and laughter. I was taught to use many tools such as; the drum, sage, the egg, tuning fork, stones, and the crystal bowls, just to name a few. I honor mother earth, father sky and my brother and sister elements. There is no separation only oneness with all.